Ever since the incident with the Ruin and Malice, Alandra has changed… A more decided and merciless look is in her eyes, she’s now more than ever determined to destroy the Ruin once and for all, as no more people should suffer what she’s been through. If you believe she’s lucky for becoming a deity after saving Malice, you need to realise all that she unwillingly sacrificed to do so in the fight with the Ruin: her life, her husband but most importantly, HER HUMANITY. 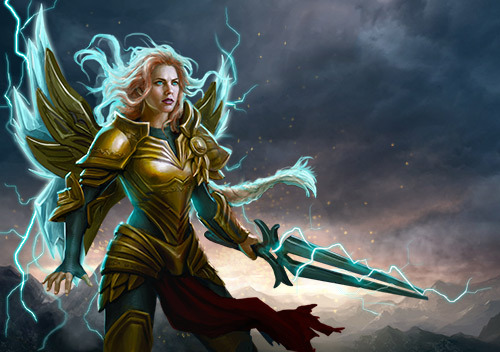 With a loud scream of war, Alandra casts her electrifying power over the endless Ruin settlements around Estara, but her power and anger need focus, help her Commander! In return you and your Kingdom will enjoy prosperity and gifts of Primus and precious Mithril. Winning a battle in in Arena, PvP & Daily Campaigns will grant you Lightning Bottles. Winning with any Battle Boost or Ascended Alandra will grant you additional Lightning Bottles. Q: Does our Kingdom need to register for the Event? A: No, you do not need to register to the Event with your Kingdom. The first battle you fight in PvP or in The Arena or in a Daily Campaign after the event’s start counts towards the event’s points. Q: My Kingdom is taking part to the Event, but I cannot earn points: why? A: You need to have a SH level 6 or higher in order to be able to earn points for the event. Q: Is there a level requirement for my Kingdom to join the Event? A: No, there is no level requirement for the Kingdom, but you need to have a SH level 6 or higher in order to contribute to the Event with your points. Q: Will my points be removed from the Kingdom’s total if I leave the Kingdom during the event? A: No, your points will not be deducted from the total points of your Kingdom if you leave it. Q: Can I contribute to the Event if I join a Kingdom after they have started collecting points? A: Yes, you can contribute with your points if you join a Kingdom after they have already started the Event. Q: I moved to a different Kingdom during the Event: will my points be added to the total of the new Kingdom? A: No, the points you scored while you were in another Kingdom will not be added to the total points of the new Kingdom if you move Kingdom during the Event. Q: Will I receive the prizes unlocked by a Kingdom if I move Kingdom during the Event? A: No, you cannot receive the prizes that were unlocked when you still were not in that Kingdom. Q: I moved Kingdom, but I haven’t received the prize when they unlocked it while I was in Kingdom: why? A: You cannot receive the same prize twice. You can claim only one prize per point tier.